Soft and sturdy. Can be made in a variety of yarn types, including machine washable/dryable yarns. 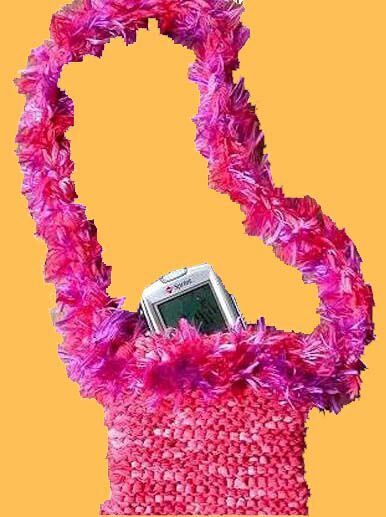 Fun cellular phone and IPod cases, featuring faux-fur trim lined cases, vibrant colors and other fun designs. Cases available to custom fit Blackberry, IPhone, SideKick, PS2, IPod, Treo, and other PDA/handheld items. Have it made the way you want it! Short or long handles/straps! Draw-string close adjustable straps! Funky colors! Thick yarn! Thin yarn! Cotton! Wool! Chunky! Faux-fur! Create your own original case. You just tell us how you want it, and we'll make it for you! 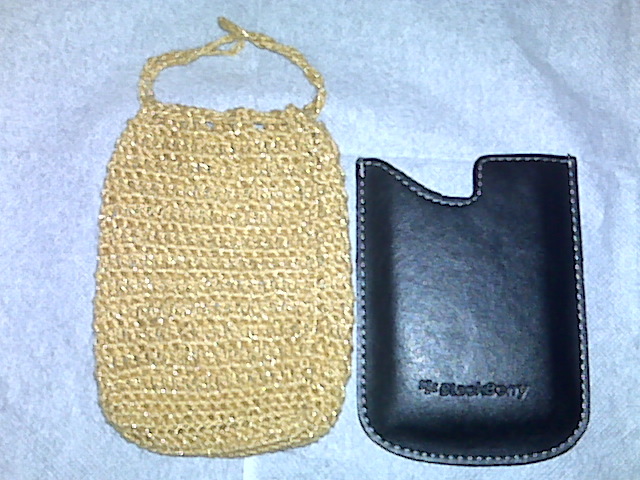 This gold blackberry case was made especially for my gold Blackberry 8320 (Curve) phone. The black case was included with the phone, but I needed some style and handles! It fits my phone perfectly and is great for quick errands (grab and secure my phone and go). The original black case also fits inside of the gold MakeIt4Me case. And I don't have to worry about phone slipping out of hand while juggling other items in hands. I can also secure the drawstring handles on my belt for hands-free security. Indicate your preferred colors of your choice during checkout. Or contact us before or after placing your order to specify color preferences.